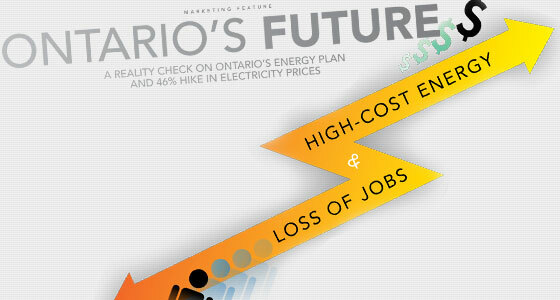 Ontario’s Future: a Reality Check On Ontario’s Energy Plan And 46% Hike In Electricity Prices. 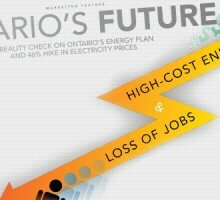 generated electricity in 2014 warn it will mean the elimination of the province’s cheapest form of electricity, will result in soaring utility bills for consumers and industry and deal another blow to a manufacturing industry already reeling from the loss of 400,000 jobs since the start of the McGuinty government. LGS is the most reliable and cheapest source of power in the province, producing electricity at about 4 cents per kilowatt hour. LGS, along with the Nanticoke coal plant on Lake Erie, provide 6,000 megawatts (MW) of steady, baseload power that can only be replaced by more expensive nuclear plants, the construction of new natural gas generating stations or by importing expensive electricity from out of province. Niche power sources such as solar and wind power are not only far more expensive sources of electricity, they are intermittent and cannot make up for the huge amount of electricitycurrentlyprovided by coal. A key argument offered by the Ontario government for closing the “dirty” coal-fired stations was that phasing out coal would clear the air, save thousands of lives and save billions of dollars in health care spending annually. Those claims of coal-related deaths and health care savings have since been debunked. Worse, the province’s argument behind the closure of the Lambton and Nanticoke plants ignores basic geography: the Lambton station sits across from Michigan’s massive St. Clair Power Plant and the Ohio corridor hosts more than 90 coal-fired plants which will continue producing affordable electricity irrespective of Ontario’s green power dreams. The irony is that the publicly owned Lambton Generating Station is already one of the cleanest coal-fired power plants on the continent. Two of its four generators, producing 950 MW utilize state of the art scrubber technology to remove 95% or more of the sulphur dioxide from exhaust flue gasses. Industry analysts recommend that OntarioPowerGenerationinstall scrubbers in the other two units of LGS, raising power generation to 1,976 MWs, a far more cost-effective solution than signing up for more enormously expensive alternative power schemes. “The technology we have in place at Lambton Generating can remove 98% of the nitric oxides and other residual pollutants,” says Ross Tius, Business Manager for U.A. Local 663, Plumbers and Steamfitters. as much as 80 cents a KWH for some small-scale solar projects. Not only is coal-fired power the cheapest source of electricity in the province, it is reliable and available 24 hours a day, compared with solar and wind which are intermittent sources at best. 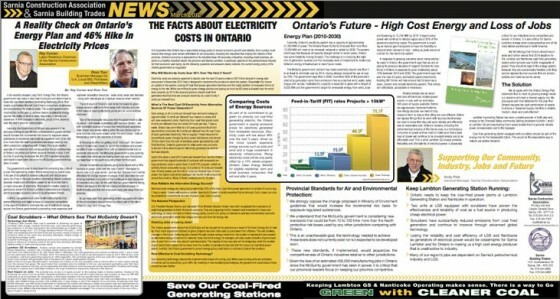 Hydro bills display a cost of 6.5 cents per kilowatt hour however the Ontario government has signed hundreds of contracts with renewable energy producers under its feed-in-tariff (FIT) program which commits consumers to pay 13.5 cents to 19 cents per kilowatt hour of wind power and between 44.3 and 80.2 cents per KWH of solar power. Many of these contracts are for up to 20 years. The potential loss of jobs is of great concern to the building trades in Sarnia-Lambton. Not only will closing LGS make electricity more expensive for industry and consumers, it will cost 90 in-plant jobs and as many as 500 trade jobs annually. By comparison, a solar power project creates only five to six permanent jobs. At the same time that Ontario is turning its back on coal, Canadian Prime Minister Stephen Harper and U.S. President Barack Obama have recognized the importance of coal-fired generation to the North American economy and they are each proposing further investment into clean coal technology. 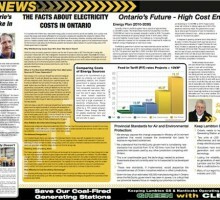 The provincial government has maintained dumping reliable and inexpensive coal power through the Green Energy Act would produce 50,000 green jobs and create a long-lasting alternative energy industry. In fact, critics contend, the opposite is true. The jobs that have been created by ramming through solar and wind installations have proven brief and very expensive. Worse, the shift to higher-cost alternative power sources made electricity prices a job killer and prices are not done rising, on a pace to soar another 46% over the next five years and to double over a 20- year period. Mr. Tius further says that Mr. McGuinty is placing a huge financial burden on current taxpayers as well as mortgaging away the future of the next generation through a seriously flawed and misguided policy. The cold, hard facts about alternative power sources and why keeping our coal fired plants makes more “cents” for our future. The Sarnia Construction Association was established in Sarnia/Lambton on June 25, 1948. With a primary focus on serving Sarnia’s extensive petrochemical industry, members of the SCA have the knowledge and specialized skills to meet the required demands on any construction project. To find more information about our members, please visit our online directory where you can find local contractors by company name and the services they offer.